One of our helpful residents; a keen rambler has taken the time to map out all the best walks in the area - well worth a look at this informative section of our website! See Footpaths & Walks. 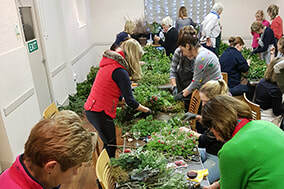 Claire Knight organised a fun, creative evening for our talented, artistic Canfield ladies at Kate Hargreaves' Christmas Wreath Workshop @ the Village Hall. We had a record attendance at the quiz night held on 8th March. Thanks to all who help organise the event and to all who participated. ​​The next meeting of Great Canfield Parish Council will take place on Monday 8th April 2019 at 8pm in the village hall. Please see Parish Council dates & minutes page for agenda and previous minutes. There will not be a contested Parish Council election. Please see Result of Uncontested election here. The District Councillor nominations can be viewed here. The notification for the European elections can be viewed here. The Gladman public inquiry is due to start on 21st May at the Stansted Centre, Parsonage Road, Takeley, CM22 6PU. This meeting is open to the public and at the Inspector's discretion you can express your views on the development. If you require further information please contact the Clerk. ​Great Canfield Parish Council Data Privacy Notice is available to view on the Parish Council policies page.